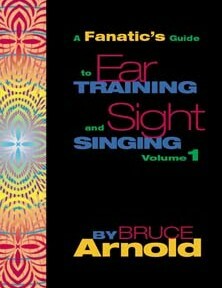 Fanatic’s Guide to Ear Training and Sight Singing our best selling singing method. The idea of singing sound based on a “key center” as opposed to singing an “interval” really began a revolution in the way musicians perceive sound. When a seasoned musician sings a melody, they are not thinking the distance between each note they are hearing, they are singing pitches within a “key center.” Seasoned musicians sing this way naturally after years of playing and singing but with Fanatic’s Guide to Ear Training and Sight Singing a student can fast forward their learning so that they can experience 30 years of ear training in a fraction of the time. A complete transformation of musical perception with this ear training concept. You will see from reading the reviews that this system of ear training has changed many musicians’ careers. Even students that are just beginning with music have found that it completely transforms the way they hear and sing music. Not being able to find the first note of the melody when you start singing a song. Why doesn’t interval training work? If you are trying to sing each note as it flows by in music, there is no way that you can calculate the distance between each note even at a slow tempo much less the usual speed that notes flow by in real time. The only way to instantly know what notes are being played is to ingrain in your mind the sound of each note within a key center so that you know the sounds you are singing in the same way that you see the color blue and know it’s blue. Our minds can’t process interval relationships at the speed needed to sing notes accurately. Maybe you have no problem in the classroom when the teacher plays a note and asks you to sing a Major 6th above it, but if you are trying to do this in time as you are actually singing a piece of real music, it becomes problematic, and the problem is compounded the more complicated the music becomes. In the real world, when music is being played in real time, as a musician, your mind just cannot calculate the intervals and analyze what you need to know in order to react properly right away. This isn’t about intellectual ability, it’s about the reality of TIME. So how do musicians identify the sounds they are singing instantaneously? In most cases we recommend you first work with Contextual Ear Training before moving on to Fanatic’s Guide to Ear Training and Sight Singing . By working with the audio files in the Contextual Ear Training over time, you gain the ability to sing the sound of all 12 notes within a “key center.” For some students this will be a quick and painless rebooting of the way they hear sound; for others it can be a frustrating path with many possible pitfalls. You have multiple singing method books. Which should I use first? Fanatic’s Guide to Ear Training and Sight Singing and Contextual Ear Training differences. Contextual Ear Training and Fanatic’s Guide to Ear Training and Sight Singing are two closely related books. The first and probably most important exercise for a beginner in the Fanatic’s Guide to Ear Training and Sight Singing is the “One Note” exercise. This “One Note” exercise develops the ability to instantly sing any of the 12 pitches over a “key center.” Fanatic’s Guide to Ear Training and Sight Singing requires you to work with a CD and check answers with an instrument to do this exercise. Contextual Ear Training allows you to do this exercise anywhere because the answer is supplied within the audio files, and it is much more portable. Therefore you will improve more quickly if you use the Contextual Ear Training “One Note” exercise because you can do it anywhere that you can take an MP3 player. Which book should I get or should I get both? We do occasionally recommend both Contextual Ear Training and Fanatic’s Guide to Ear Training and Sight Singing to students that are working in a choir or other places where they are reading music. With Contextual Ear Training you are not singing notes from a page. It will help you to sing notes from a page once you gain the ability to hear all 12 notes of a “key center,” but it does not build your sight reading skills. Fanatic’s Guide to Ear Training and Sight Singing does contain many exercises that require you to sing notes from a musical staff. So if you are a singer who needs to work on both aspects of your musicianship we recommend both books. Practicing Ear Training from two different perspectives is the best way to improve. With this in mind we have created a whole series of books that develop these two aspects of ear training. They basically boil down to listening exercises and singing exercises. For someone just starting our method we recommend: Contextual Ear Training and Ear Training One Note Complete. Fanatic’s Guide to Ear Training and Sight Singing and Ear Training One Note Complete together make a great ear training program. Listening exercises found in Ear Training One Note Complete teach you to identify the sounds from external sources such as another band member or a song that you are hearing on your MP3 player. Singing exercises found in Fanatic’s Guide to Ear Training and Sight Singing help you identify the sounds you hear inside you when you are singing, improvising or composing. You need both sides of ear training to become a great musician. The good news is they complement each other so the more you work on one, the more it will the help the other. Bruce Arnold is here to help you through the process. Some students can fly through this ear training with no problem. But many musicians have problems and need personal help. But have no fear, Mr. Arnold offers email support for students as they work through this process! So rest assured as you enter this ear training method, that you are not alone, and you can get expert help if you run into problems. Helping musician for almost two decades! This method has been transforming musicians for almost 20 years now. It’s one of the best selling Ear Training systems on the market. Simply put: It is successful because it works! BUT the secret weapon is Bruce Arnold. He is only an email away to help you. If you are a beginning or an advanced student seeking to perfect your skills, you can call on Bruce to help you through this process. First let’s talk about how you will be doing this ear training. We have found that the best way to do this ear training is with an MP3 player. It allows for many more ways to organize the audio files and is most portable. We do offer physical books and CDs with with some of our ear training products but we HIGHLY recommend you not take this path with our ear training method. Why? Because digital downloads are a much better way to study this ear training as MP3s are much less expensive, easier to organize, more easily portable and cost half as much as physical books with CDs. We also have many ear training products that are ONLY available as digital downloads so it just makes more sense to go the digital route. So unless you REALLY can only use a CD player we sincerely recommend that you buy digital downloads of our ear training products. For singing we most commonly recommend students start with Contextual Ear Training. and then move on to Fanatic’s Guide to Ear Training and Sight Singing . Also with Fanatic’s Guide to Sight Singing and Ear Training…we recommend you work with Ear Training One Note Complete. Where do I go after I finish Fanatic’s Guide to Ear Training and Sight Singing ? Once you have worked through the exercises in Fanatic’s Guide to Ear Training and Sight Singing we recommend you move on to Key Retention Builder. A more complete understanding of the method. An insight into the problems and solutions others have had with this ear training. Encouragement and determination that you can do this, and that it just takes daily dedication. The proof that EVERYONE that has really put their mind to it has mastered this ear training without exception. The reason why dedicating a short amount of time each day: 5 to 10 minutes 5 to 10 times a day will be all it takes to master this ear training. Mr. Arnold’s Blog on ear training and other musical topics can be very useful to learn about our ear training products. Some of the topics covers are linked below. Ear Training for Young People. Our ear training books are available worldwide at different on-line stores. It is important to realize that there are physical versions of our books available that don’t include the CDs. The book will plainly state in the description that it doesn’t include a CD(s). In those cases you can either purchase a CD from Muse-eek.com or digitally download it from our website or itunes. If you have lost a CD or it’s become damaged you can also order or download replacements. CDs and Downloads only (contains no book). Melodic “Two Note” method recommended when you are getting 50% correct answers on any “One Note” level. Instrumental Color Series recommended when you are getting 50% correct answers on any “One Note” level. 85 pages and 12 MP3s. This method is excellent! If I could give it more than five stars I would. If you’re willing to put in the time it pays off. I have been working on the exercises from this book for almost a year and my ear has improved tremendously. Follow Mr. Arnolds directions in the book exactly as spelled out and you will do yourself a big favor. He has put in the time learning this material himself and knows all the pitfalls of doing it wrong and has distilled a method that works. He learned from the pros and has published what he learned. If you want a nice glossy book with lots of cool pictures this isn’t for you. If you want something that works get it, do it, and you’ll be amazed. The bottom line is you have to the work for the results. I have noticed some reviews that note the starkness of Mr. Arnold’s books. His books are all substance and no jive! He shows his dedication to the material he presents by providing a FAQ section on the museek Website. You can submit a question and he answers it right away, sometimes in minutes, never more than 24 hours. That really surprised me! M. Todd. Get Fanatic’s Guide to Ear Training and Sight Singing today and transform your sense of key. What should I work on after Fanatic’s Guide to Ear Training and Sight Singing? This entry was posted in Ear Training and tagged bruce arnold, ear training lessons online, contextual ear training, bruce arnold ear training, ear training one note complete, why interval ear training is bad, aural comprehension, aural skills, good ear, ear trainer, ear training tools, online ear training, big ears, ear mastery, pitch improve, ear training exercise, ear training tutor, ear training by Muse Eek. Bookmark the permalink.